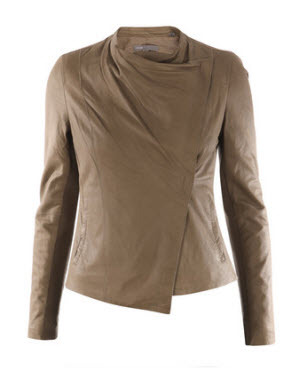 Effortlessly cool, the combination of this sleek tank and slouchy short topped with a draped leather jacket from Vince is the ultimate in urban chic. Pair this Vince paper weight leather jacket with black lace up boots, aviator sunglasses with a small cross body messenger bag. Whether you are running errands, or going out on the town, this is the kind of jacket that makes you look cool and the leather only gets better with age. However, if you are fancying at the price of US $995 at Polyvore.com, stop by at Once Again as you can steal this brand new jacket at a fraction of its original price.